Neogo have started up an IndieGoGo campaign to port their well received mobile stealth game, Level 22 : Gary’s Misadventures, to PC and Mac. 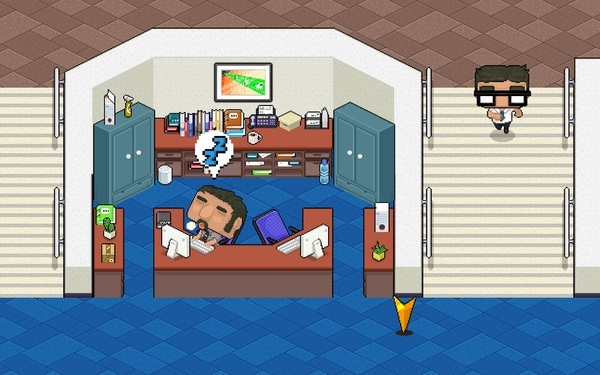 In Level 22 players assume the role of Gary, the type of slacker office worker who spends more energy avoiding work than actually doing it. And with that we have the point of the game; sneaking around a variety of environments using stealth, misdirection, and underhanded non-lethal weapons to avoid detection. Gary can hide in closets, under cardboard boxes, car trunks, and even air vents to avoid the all seeing boss man. In addition to sneaking you can booby-trap various office equipment to create distractions, lace food with laxatives to keep people busy, or simply throw objects to turn some heads the other way. Seeing as how Level 22 has already been released for iPads and Android tablets it’s easy enough to see if this is a project you’d like to back. The reviews are very positive overall, praising the cute graphics, fun gameplay, and comedic situations. The only downside consistently mentioned is the games lack of replayability, an issue that’s not likely to be addressed with this funding campaign. With that being said, the Neogo are only looking for $8,000 to get the job done, so set your expectations accordingly. The IndieGoGo campaign for Level 22 : Gary’s Misadventures runs until December 15th.